Convert your forklift into a dedicated loader with our easy-to-use carriage mounted forklift scoops and buckets. 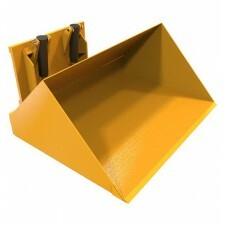 Directly mounted to the forklift carriage, our range of forklift scoops and buckets are ideal for use in construction sites, recycling plants, builders’ merchants and many more. Just like having a big shovel attached to your forklift, the carriage mounted forklift scoops and buckets in this range are all hydraulically operated, with an infinitely-controllable discharge rate. Designed and built to meet the rigours of everyday industry, our forklift scoops and buckets have been engineered to cope in the most arduous of conditions, and in doing so will provide you with a cost-effective material handling attachment for many years to come.